Now that iOS 10.3 is almost ready for a public release, the online ‘noise’ about a possible iOS 10.3 jailbreak is simply unbearable. Fakes mixed with highly unreliable hacks and then infused with a bit of authentic-sounding jargon – and that’s the best case scenario. The worst is websites that take you to scam surveys or sites that offer to “sell” you a jailbreak for $29.95 or $49.99 or whatever. 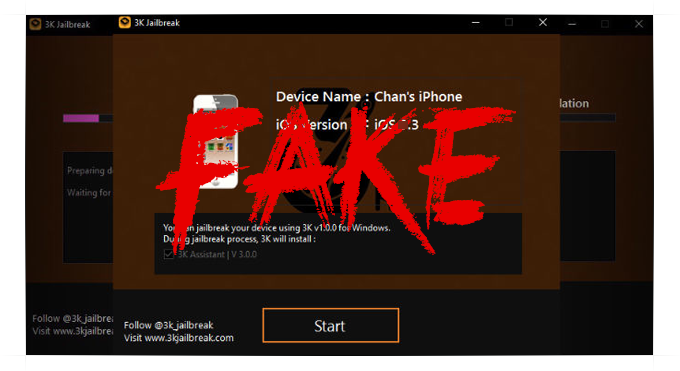 How do you know which jailbreak is a genuine and which isn’t? Unfortunately, there’s no way to tell unless you’re familiar with the iOS jailbreak landscape. Luckily, there are a couple of ways to learn about bad experiences from enthusiastic jailbreakers who have sacrificed their devices so others can benefit. Don’t visit any site that claims to offer an iOS 10.3 jailbreak until you read this article in full. One of the best sources to check when you come across a jailbreak possibility – whether it’s for an older iOS 9 jailbreak or a so-called iOS 10.3 jailbreak – is the iPhone Wiki. This is a community site for all things iPhone, and it has some tremendously useful resources to help you get on the right track. More accurately, it can get you off the wrong one. One of the more helpful pages on the site is a list of sites that are known to be fakes, scams or otherwise suspect. You might consider some of them to be harmless, like sites that get you to download apps in the hope that you’ll make an in-app purchase, for example. Others are outright malicious, waiting to inject malware into your phone and rendering it completely useless. Here’s the link to that page. Hopefully it’ll help keep you and your device safe. If you come across a possibly genuine jailbreak, Google to find out more before you jump in and start the process. You can try search terms like ‘[jailbreak site] review’, ‘[jailbreak site] feedback’, ‘[jailbreak name] review’ and so on. See what you can find about a jailbreak before you try it out. See what the community is saying. Head over to social media forums like Reddit [https://www.reddit.com/r/jailbreak/] and see if there’s any mention of that jailbreak you just came across. For example, you’ll find the Yalu Jailbreak for iOS 10.0.1 to iOS 10.2 on a wiki within that subreddit: Wiki Page for Yalu JB 64-bit. Another useful resource is the community section or forum of well-known websites like MacRumors. On such forums, you’ll see a vibrant community of jailbreakers helping each other out. This is exactly what you need if you’re new to jailbreaking. Never give out your personal details when a jailbreak site asks you to do so. Expert and legit jailbreakers will never ask for your details because they have no use for it. The ones that do are dangerous, so stay away. Never pay money for jailbreak. If there’s something behind a paywall, you don’t need it. Be extra careful when a site says ‘money back guarantee’ because it’s just a ruse to try and make you feel more comfortable about paying money. Also stay away from sites that make you take a survey first. Jailbreakers don’t need to know who you are. The big guys are already top-notch security researchers that make thousands of legitimate dollars from bug bounties given out by software companies like Apple. As for the possibility of a genuine iOS 10.3 jailbreak, we’ll only know if one is coming after iOS 10.3 is released to the public. Judging by the beta timeline for the latest version of iOS, it could be sooner than you know. Every major jailbreak expert with a solution will remain silent about this for now, just in case they have an exploit that works and Apple spoils it by patching it ahead of the iOS 10.3 public release. A jailbreak tool for iOS 10.2.1, however, is a definite possibility. If you want to wait for that, we suggest you save the shsh2 blobs for iOS 10.2.1 for your devices ahead of the iOS 10.3 release. Apple is sure to stop signing iOS 10.2.1 right after iOS 10.3 drops, just like they did with iOS 10.2 when iOS 10.2.1 was released to the public.